Introduction: Movement-disabled individuals require oral health care like everyone else. However, they face a multitude of accessibility issues. Since private dental clinics are the most commonly utilized type of oral health care in India, it becomes pertinent to know how accessible these clinics are for movement-disabled individuals. Aim: To assess the accessibility of private dental clinics in Bengaluru city to movement-disabled people. Materials and Methods: A cross-sectional survey was conducted among a random sample of 250 dentists practicing at private dental clinics in Bengaluru city using a structured questionnaire. The data were entered into the Microsoft Office Excel 2007 and were analyzed. Chi-square test was done to assess the association of dentists' previous experience in treating mobility-disabled patients and their attitude toward treating such patients. Results: In the current study, 81.2% (203) of the respondents expressed willingness to treat mobility-disabled individuals. However, wheelchair provision was present in only 15.6% (39) of the clinic, and only one-fifth of the clinics had a slope or ramp for facilitating entry of wheelchair-bound individuals. Gurneys, stretchers, and ceiling-mounted lifts were present in <10% of the private dental clinics. The reasons for poor accessibility to movement disabled were reported as lack of financial resources followed by lack of utilization of facilities by movement-disabled individuals. Conclusion: The dentists displayed favorable attitude toward treating movement-disabled individuals. However, only a few private dental clinics met the architectural requirements and were equipped for treating such patients. Physical disability affects everyone at some point of life. A child, a person with broken leg, a parent with a pram, etc., are all disabled in one way or another. In India, over 21 million people are suffering from one or the other kind of disability. Among these, 27.9% are movement disabled. Movement disabilities mainly consist of impairments that confine individuals to wheelchairs, braces, crutches, amputees, arthritics or spastics due to which they tend to walk with difficulty or insecurity and those with pulmonary and cardiac illnesses may be semi-ambulatory. Persons with movement disability have oral health care needs like the rest of the population. In addition to financial and cultural barriers, these persons also face physical barriers to access oral healthcare services. Improved access should be considered in each of the following areas: transportation and entrance to the facility, entrance to the office, waiting rooms, restrooms, examination rooms, general building features. Health professionals and the organizational systems, upon which they depend, have a professional and moral obligation to all members of the community. Unfortunately, immense inequalities still exist in relation to oral health, particularly among patients requiring special care. “Universal accessibility” is a philosophy that describes full access for all people and is realized through “barrier-free design.” As far as the built-up environment is concerned, it is important that it should be barrier free and adapted to fulfill the needs of all people equally. In India, there are standards intended to make all buildings and facilities used by the public accessible to the physically challenged., This includes all health-care service facilities including private dental clinics, which provide oral health services to majority of Indians. However, there are no studies done to ascertain the implementation of these guidelines by private dental clinics in the country. Hence, the present study aims to assess the physical accessibility of private dental clinics in Bengaluru city to movement-disabled individuals. A cross-sectional survey was conducted utilizing a structured questionnaire in private dental clinics during July–September 2014 in Bengaluru city. Ethical consent was obtained from the Institutional Ethical Review Committee. The sampling frame consisted of 672 dentists registered in Indian Dental Associations' Directory. A sample size of 218 was obtained keeping a confidence level of 95%. This figure is rounded off to 250. Simple random sampling was done to obtain a sample of 250 dentists practicing in private dental clinics in Bengaluru city. The questionnaire was designed based on the “Guidelines and Space Standards for Barrier Free Built Environment for Disabled and Elderly Persons,” given by Central Public Works Department, Ministry of Urban Affairs and Employment, India, and Draft Indian Accessibility Standards: Recommendations for Buildings and Facilities for Inclusion of Persons with Disabilities Compiled by National Centre for Promotion of Employment for Disabled People. And Americans with Disabilities Act. Access to Medical Care for Individuals with Mobility Disabilities. reference number  The questionnaire was tested for face validity and content validity. This first draft of the questionnaire was pilot tested on a group of 25 dentists. Their feedback was used to revise the questionnaire and develop the final version. The questionnaire consisted of five components: personal and demographic information, attitude toward treating mobility disabled, physical accessibility of dental clinic, availability of medical equipment, and other questions such as the dental practitioners opinion about the relevance of being able to provide physical accessibility for movement disabled and a question to assess the reason behind not being able to provide full physical accessibility of the dental facilities to movement-disabled individuals. The participants were explained about the study and informed that information provided by them will be kept confidential and consent to participate in the study was obtained. A self-administered questionnaire was used to collect information regarding the accessibility of the building and facilities of the dental clinic by movement-disabled individuals. The data were entered into the Microsoft Office Excel 2007 and were analyzed. Chi-square test was done to test the association of dentists' previous experience in treating movement-disabled patients and their attitude toward treating such patients. A P < 0.05 was considered as statistically significant. [Table 1] describes the attitude of the dental practitioners toward treating movement-disabled patients. A vast majority of the respondents displayed positive attitude. As seen in [Table 2], dentists with previous experience of treating movement disabled had better attitude as compared to dentists who did not have any such experience previously (P < 0.05). Out of the 250 clinics visited, 12% were situated in basement, 35% were situated in ground floor, 45% were situated in the first floor, and 8% of them were situated higher than first floor. [Table 3] shows the number of private dental clinics which meet the architectural requirements for facilitating treatment of movement-disabled patients. [Table 4] describes the presence of special equipment required for treating movement-disabled patients in dental clinics. Adjustable height examination chairs and tables were there in 91.6% of clinics, and adjustable radiologic equipment was present in 87.6% of the clinics. [Table 5] describes the number and percentage of private dental clinics which have facilities for movement-disabled patients. About 83.2% of the private dental clinics had accessible counters and reception desk, and 76.4% of them had drinking water facility compatible to the wheelchair bound. Only 6% of them had toilets with handrail. More than three-fourth of the dentists gave a score of seven or more on a scale of ten regarding their opinion on the importance of providing physical accessibility to movement-disabled patients in private dental clinics. Lack of financial resources (50.8%, 127 responses) was reported as the leading cause for not making provisions for making private dental clinics disabled friendly, followed by lack of utilization of dental services by such individuals (42.8%, 107 responses). Assessing the physical accessibility of private dental clinics demonstrates the preparedness of private dental clinics in Bengaluru city to receive persons with movement disability and provide services to them. However, a complete comparison with other studies cannot be made as some of the studies include individuals with various physical disabilities while the present study is restricted to mobility-disabled individuals. Some of the studies are done only with specifications of physical accessibility without the inclusion of medical equipment while the present study intends to include both. The dentists displayed a favorable attitude toward treating movement-disabled patients. In the present study, 81.2% of them were comfortable in treating movement-disabled individuals. This is similar to the findings of the study by Edwards and Merry. In the present study, 85.6% of the practitioners report as having treated mobility-disabled patients which is comparable with the study by Smith et al. among Irish dentists. The participants were categorized based on their willingness to undergo further training to increase competency in treating mobility-disabled individuals. About 15.6% of the practitioners were not willing to undergo further training. This clearly demonstrates that the dentists were unaware of special care dentistry which is a specialization being developed worldwide to increase competency to treat special care patients including mobility-disabled persons. In the present study, only 35% of the dental clinics are situated in ground floor. Better observation was reported by Freeman et al. where 55% of dental practitioners had a ground floor surgery. In this study, 87.2% of the clinics have stairs but only 16.8% of the clinics have a provision for lift, and 20.8% of the dental clinics have a ramp/slope of sufficient width and 70.4% of the clinics which require lifts do not have it. This out-rightly makes such facilities out of reach to mobility disabled individuals. Better observations were made in a study by D. M. Edwards et al reference number  which reported that almost half the practices had ground floor access with steps and one-eighth had only first floor surgeries without a lift. In India, there are standards intended to make all buildings and facilities used by the public accessible to the physically challenged. A large number of dental clinics surveyed failed to meet the architectural specifications. Fukuda et al. strongly feel that dental practitioners are obligated to understand the architectural and perceptual barriers faced by disabled persons and the aged and consider barrier-free office designs for all patients. Standards about availability of accessible medical equipment for dental treatment of individuals who are movement disabled in India do not exist. Since availability of accessible medical equipment is an important part of providing medical care, practitioners and providers themselves must ensure that medical equipment is not a barrier to individuals with disabilities. 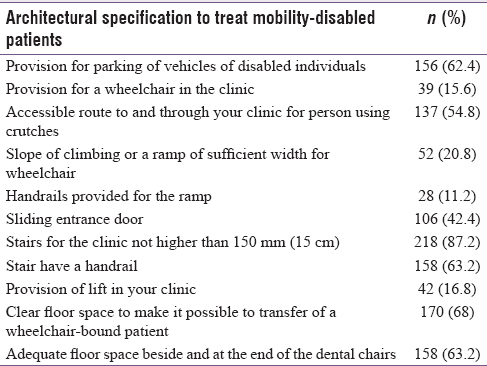 In this study, very few clinics were equipped with ceiling-mounted lifts (7.6%), stretchers (6.4%), and wheelchair accessible scales (12%) required for the care of movement-disabled patients. The dentists were asked to rate on a scale of 10 the importance of providing physical accessibility to movement-disabled individuals, and 78% (197) of the dentists responded positively stating that it is very valuable to be able to provide full physical accessibility to mobility-disabled individuals. Similar observation was made by Smith et al. The dentists' opinion about the reason for poor accessibility of private dental clinics to movement disabled was solicited. Most of the dentists mentioned the reasons being lack of financial resources, followed by lack of utilization of resources by movement-disabled individuals. A fair proportion of dentists also opined lack of awareness and lack of training to be the obstacles. Similar concerns regarding the financial cost were raised by the respondents in a survey in the United Kingdom. Comparable observations were made by Edwards and Merry, who stated physical barriers, lack of time, and lack of equipment for domiciliary treatment as the three main factors impeding accessibility of oral health services. Jones and Tamari  stated cost, validation process, and limitation of time and geography as the major reasons for limited accessibility. Nunn et al. observed a multitude of factors such as lack of government engagement, unhelpful legislation in relation to disadvantage, poor healthcare education, inequitable distribution of healthcare workers, cultural barriers, lack of professional commitment to excluded groups, lack of undergraduate and postgraduate education in the field of special care to motivate young colleagues to make a commitment to this field of dentistry as the major reasons for the lacunae. The limitation of this study is that it does not include any information about if the dentists make an attempt to go to the place where movement-disabled individuals reside and provide them services and do not include certain other reasons behind not being able to provide full physical accessibility. The study did not assess whether the dentists were competent to or knowledgeable to treat patients with special needs. Since a self-administered questionnaire was used, the desirability bias by the respondents is reduced. The questionnaire used did not have any component on relevant practice, namely, protective body stabilization practices, operator, and patient positions. However, additional studies from the perspective of the movement-disabled individuals are required to go to the root cause of this problem and to bridge the gap. The present study clearly describes the inadequate accessibility and preparedness of a high percentage of private dental clinics in Bengaluru city for treating movement disabled people. The number of dentists willing to treat movement-disabled individuals was found to be high. However, it is unfortunate to know the number of clinics with facilities does not match the number of dentists willing to treat such patients. It is clear that movement-disabled patients are being treated in spite of lack of available facilities which is very distressing. We acknowledge all the dentists who participated in the study and Short term studentship program 2014 conducted by the Indian Council of Medical Research, New Delhi. A stipend of 10,000 rupees was given by the Indian Council of Medical Research, New Delhi. Census of India – 2011, Office of the Registrar General and Commissioner, India; 2011. Available from: http://www.censusindia.gov.in/Census_And_You/disabled_population.aspx. [Last accessed on 2014 Jan 10]. Jones KE, Tamari IE. Making our offices universally accessible: Guidelines for physicians. CMAJ 1997;156:647-56. Faulks D, Freedman L, Thompson S, Sagheri D, Dougall A. The value of education in special care dentistry as a means of reducing inequalities in oral health. Eur J Dent Educ 2012;16:195-201. Wilson KI. Treatment accessibility for physically and mentally handicapped people – A review of the literature. Community Dent Health 1992;9:187-92. Draft Indian Accessibility Standard: Recommendations for Buildings and Facilities for Inclusion of Persons with Disabilities Compiled By National Centre for Promotion of Employment for Disabled People. Available from: http://www.uncrpdindia.org/files/reports/CoreGroup-Accessibility-Physical-Access-Standards-Revised.pdf. [Last accessed on 2014 Jan 10]. Guidelines and Space Standards for barrier-free built environment For Disabled and Elderly Persons. Central Public Works Department, Ministry of Urban Affairs and Employment, India, 1998. p. 1-13. Accessible at http://socialjustice.nic.in/glinecpwd.php?pageid=1. [Last accessed on 2014 Jan 27]. Indian Dental Associations' Directory, Registered Dentists in Bengaluru, Karnataka Available from: http://www.ida.org.in/master.htm?ProgramId=11&url=Search/dentistdirectory.aspx&catid=579. [Last accessed on 2014 Jul 21]. Guidelines and Space Standards for Barrier-Free Built Environment for Disabled and Elderly Persons. Central Public Works Department, Ministry of Urban Affairs and Employment, India; 1998. Available from: http://www.socialjustice.nic.in/glinecpwd.php?pageid=1. [Last accessed on 2014 Jan 10]. Americans with Disabilities Act. Access to Medical Care for Individuals with Mobility Disabilities. Available from: http://www.ada.gov. [Last accessed on 2014 Jan 10]. [28:i-ii; 1-19]. Edwards DM, Merry AJ. Disability part 2: Access to dental services for disabled people. A questionnaire survey of dental practices in Merseyside. Br Dent J 2002;193:253-5. Freeman R, Adams EK, Gelbier S. The provision of primary dental care for patients with special needs. Prim Dent Care 1997;4:31-4. Fukuda H, Saito T, Tsunomachi M, Doutsu T. Wheelchair-accessible dental offices in Nagasaki, Japan. Community Dent Health 2010;27:187-90. Nunn J, Freeman R, Anderson E, Carneiro LC, Carneiro MS, Formicola A, et al. Inequalities in access to education and healthcare. Eur J Dent Educ 2008;12 Suppl 1:30-9.